On the October 26 airing of SBS's 'Laws of the Jungle', new members Boom, Weki Meki's Kim Do Yeon, and NCT's Lucas joined Kim Byung Man and his crew in Sri Lanka! During his introduction, Lucas revealed "I have a fire heart fire(?) inside me. I'm full of ambition," as well as that he wasn't afraid of bugs, mosquitos, ghosts, or anything on his upcoming trip to the jungle! 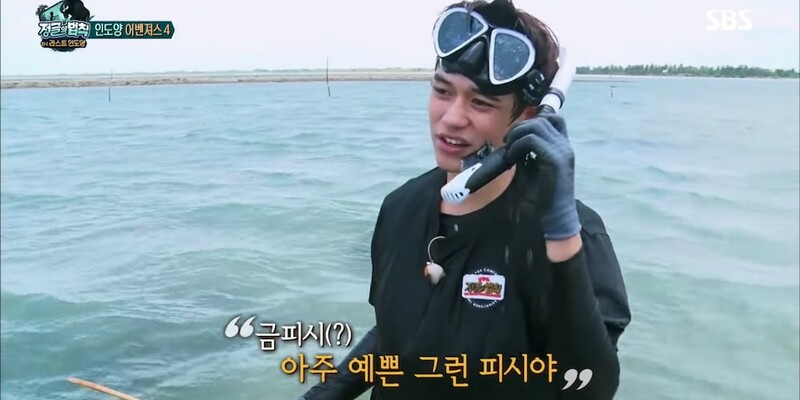 Later on, as Lucas set out with Kangnam, Kim Sung Soo, and Moon Gabi to gather food, it was revealed that Lucas used to be part of a spear throwing team during his school days. Humbly, Lucas shared, "I was only a little bit(?) good at it. I could have won 1st place [during a competition] but... I ended up getting 2nd place..."
However, on this week's episode, Lucas's spear throwing skills proved unhelpful when attempting to pick coconuts from a very tall tree. Thankfully, the crew was able to find a shorter coconut tree, quenching their thirst. You can also find additional clips of Lucas from this week's 'Laws of the Jungle' below!